Early in August I was told to get ready to go with the XXIV Corps as a G-4 observer. Advised my boss that I had several things to do before I could leave his office in good shape – to be gone two months. He then sent another officer who was wounded bat has returned to duty. carry a working knowledge of the one headquarters to the other. You see this was formerly Harmon’s South Pacific Area and is now called South Pacific Base Command under Richardson. What I did to cause them to “lower the boom” on me remains a mystery. However, I like it and seem to be getting along. Expected more time between receipt of orders and departure date, but the ATC called me in a hurry and had my Alohas cut short. Never heard further about your Legion of Merit. You might let me know about it. Sure enjoyed your acquaintance, the hospitality you and Mrs. Turner showed me, and will regard you as a friend to remember. P.S. 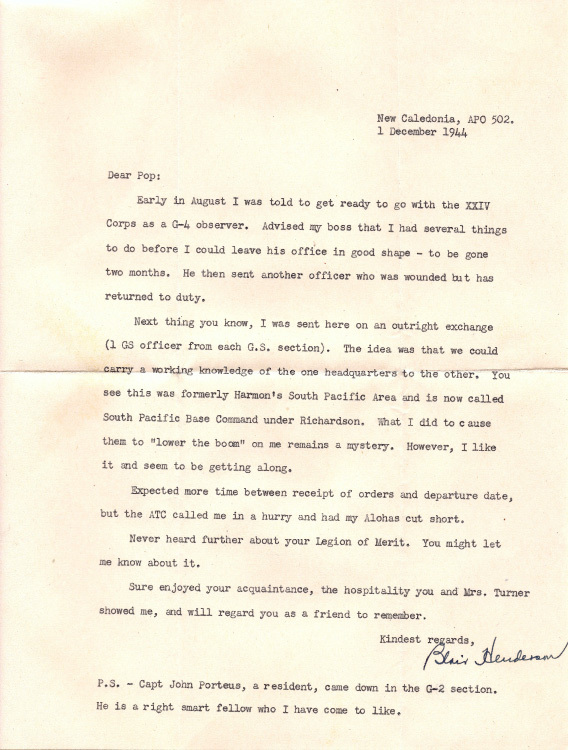 – Capt John Porteus, a resident, came down in the G-2 section. He is a right smart fellow who I have come to like.